One day not so long ago, I received a call from one of my best buddies, who happens to live in the valley right below me. She called to tell me about a creepy raccoon that was parading about on their property at all unrighteous hours of the day. I mean, it LOOKED innocent enough. At least not in my area. It was rabid, I was certain. When I heard that my friend’s neighbor had found the raccoon dead inside her chicken coop (umm, how’s that for weird?) my suspicions were cemented in my mind as truth. A plague of rabies was sweeping our town. Immediately, every furry creature I saw was a slobbering, blood-thirsty crazy thing. Despite this fact, my friend and I decided to take an evening stroll down a backroad one gorgeous spring night. We chilled in the pool for a little, and somehow got on the subject of maturity. A person we had both heard recently had said that “A young person does not reach full personal maturity until they reach 25 years of age, sometimes even later.” We both violently disagreed. What right did this person have to toss all teens and young adults in the ‘Pampered American Brat’ boat? Some kids successfully navigate harder issues at 14 and 15 years of age than most adults have to face in their lives! The statement was very unfair, we both agreed, and highly resented it. We, of all people, had definitely reached full maturity long before we reached this projected age! That agreed upon, we jumped out of the pool, took to the open road and turned our minds toward other things. I turned just in time to see a furry body hop freakishly towards us for a few paces, and then dart into the weeds beside the road. And then we both burst into action. There is no time to lose when a 11-inch furry creature threatens your walking safety. “Maybe we should just keep going.” my friend said calmly. “NO! Grab a stick!” I commanded as I dove into the plethora of poison ivy along the side of the road. I emerged instantaneously with two moldy logs, and thrust one towards my friend. Unfortunately, it fell into about 6 pieces before she could even fully grab it. My log, however, was hefty enough to hold threateningly in front of me like a proverbial jousting lance. 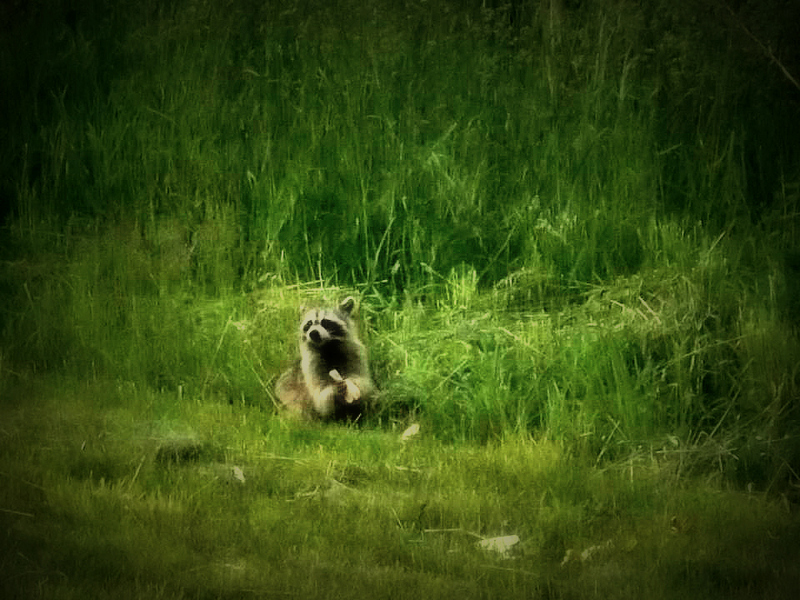 I staunchly dared that unseen raccoon to come closer as my friend and I inched away. Unfortunately, while inching away, we were also inching away from home. And it was getting dark. “Maybe we should just have someone from my house come pick us up.”, my friend suggested. And so, two mature adults waited nervously by the side of the road while the sun dropped lower and lower below the horizon, and scanned the forest leaves for those blood-shot, crazy eyes that were undoubtedly waiting for us to let down our guard. Finally, a well-known blue van pulled up and we tossed our protective moldy log into the forest and dove into the van’s safe recesses. And immediately began to howl with laughter. It was all just SO bloomin’ ironic. I shook my head at myself in pity. Was this Kara–the same Kara who had just scoffed at the implication that maturity does not blossom until 25–now guilty of calling her friend’s mother to save her from a furry animal? Was this the same Kara who slept under the stars, hiked in the dark, and spent two seasons leading wilderness trips so unsure of her stick-wielding skills that she had to flee the scene even though the supposed enemy was nowhere in sight? It was so plumb ridiculous. We all just sat in that van and laughed. When we got back to my friend’s house, we told the neighbor (who was also present during our previous maturity debate) the story and she laughed too. We still laugh about it now. And yes, you’ve guessed the brutal truth. I still have a fear of possibly-rabid creatures. Aaaagh! Does that mean my maturity is forever at stake? What is your definition of ‘mature’? Do you pin an age on it? When was the last time your foot took an unwanted trip into your mouth? Let me know in the comments below! !